The five swimmers who made the Turtle Relay come to life. 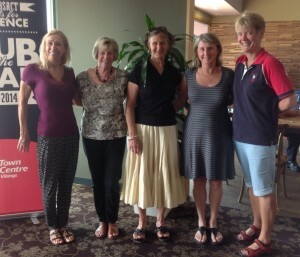 Brenda Day, Pauline Rohan, Catherine Alexander, Maria Castles and Cecelia Kaye. Five swimmers who regularly swim the Endurance sessions, turned up last Tuesday, 10 February 2015 to complete a 5km Freestyle relay for the Wests Auburn Masters Postal Swim. 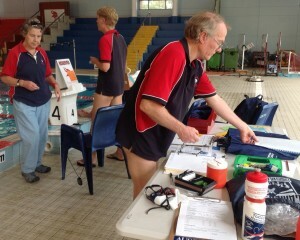 Katrina, our Postal Swim Coordinator, admiring our results. We were the first to complete the Wests Auburn Turtle Postal Swim. With great minds and many stop watches, they clocked each other’s 1km legs and then clocked up the extra minutes to either the 30 min or 1500m Endurance swims. Two results from one swim has to be good. The reason these members all chose to do this on a Tuesday morning is that the pool is generally very quiet and calm, lanes are booked, and they have that morning allocated for swimming. Tuesday morning Endurance Sessions are very calm. Last Tuesday we had the whole 25m north end to ourselves. The turtle swim participants certainly were not the only endurance swimmers that day. As this endurance session is never overcrowded, Tuesday AM swimmers can easily get in two or three timed swims. All set up and ready to record our 5x1000m Turtle Relay. If you think you would like to explore more avenues of our clubs activities, think about joining us for the Endurance sessions, on Tuesday mornings – 10:30am – 12 noon. We have fun, enjoy the friendship and improve our fitness! There are also Endurance sessions on Saturdays 10:30am – 12.30pm. Over the October long weekend (3-6 October 2014), several members from our club participated in a swim camp at Thredbo. Swimmers attending were Crawford and Marshall O’Brien, Greg Gourley, Leisa Cass, Caroline Makin and Anne Smyth. Organised by Susan Leech from Ryde Masters, the weekend is always a good event involving six two-hour swim sessions with time in between for some relaxing and exploring the delights of Thredbo. Most of the team stayed at Boali Lodge where they were looked after superbly with three fantastic meals provided every day. After hours activities included a poetry reading night organised by Ryde’s Jamie Turner and social drinks at Thredbo pubs. During the day many explored Thredbo’s walks and even indulged in some retail therapy. Now for the swimming! The Ryde coaches, Greg Lewin and Wendy Searle, organised the sessions with Anne and Caz from Tuggeranong helping out with stroke technique. The squad also enjoyed a beep test session run by Greg Gourley which was well received by our Ryde swimming friends! The sessions involved a stroke focus each session, sprint work and starts. With the focus on technique, mileage was achievable with only muscle fatigue evident by the final day and some tiredness from the very early morning starts. It is a really enjoyable weekend away, combining the essential elements of Masters Swimming – fitness, swimming, friendship, good food and wine! We are very lucky that Ryde includes our club in this special weekend – so keep it in mind for next year! All levels of swimmers are catered for and many use the weekend as a mini holiday bringing along partners and children. If you have any questions about the weekend, just ask one of us who have attended. NSW Branch – 1st place ahead of Campbelltown, Castle Hill and Wests Auburn. Nationally – 1st place Talays, 2nd place Campbelltown, 3rd place Castle Hill ….. 12th place Tuggeranong with 160.51 points. We had 90 members registered in 2013 and 49 who swam at least one endurance swim – so, congratulations to our 49 participants for our great results and commitment to the Endurance 1000 programme. Tuggeranong were represented by over half our total membership! 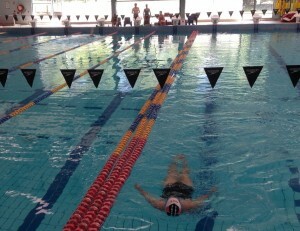 More information can be found http://e1000.mastersswimming.org.au. Six members: Katrina Burgess, Brenda Day, Pam Munday, Jon McCrae, Ann Reid and Andrea Teunissen completed all swims in the programme. All but one person achieved the full 1005 points for the year. Our seasoned endurance swimmers and new members (who came along to find out what the Endurance mornings are about) participated. Several of our newer members found out that a 400m or 800m swim was a ‘do-able’ swim and not the ‘impossible.’ The experienced endurance swimmers thought nothing of braving Tuggeranong’s winter conditions to challenge themselves to amazing feats such as 800m Butterfly and 1 hour continuous Breaststroke, sometimes diving into pools where the water temperature felt on par with the outside air temperature. The contribution of Pam Munday, Jane Lindsay and many more members, friends and family who assisted with the setting up, timekeeping, recording of times and lane bookings cannot go without mention. 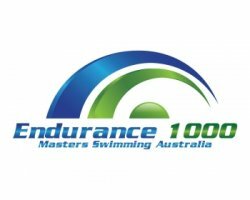 Thank you to everyone who contributed both on deck and in the pool to the great results for our Tuggeranong Vikings in the 2013 Endurance 1000 programme. 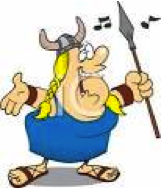 It is never too late to start your own Endurance 1000 campaign. All swims count to our tally for the year and they are another way to build up fitness and to get to meet fellow members. More info about taking part in our Endurance sessions is available. 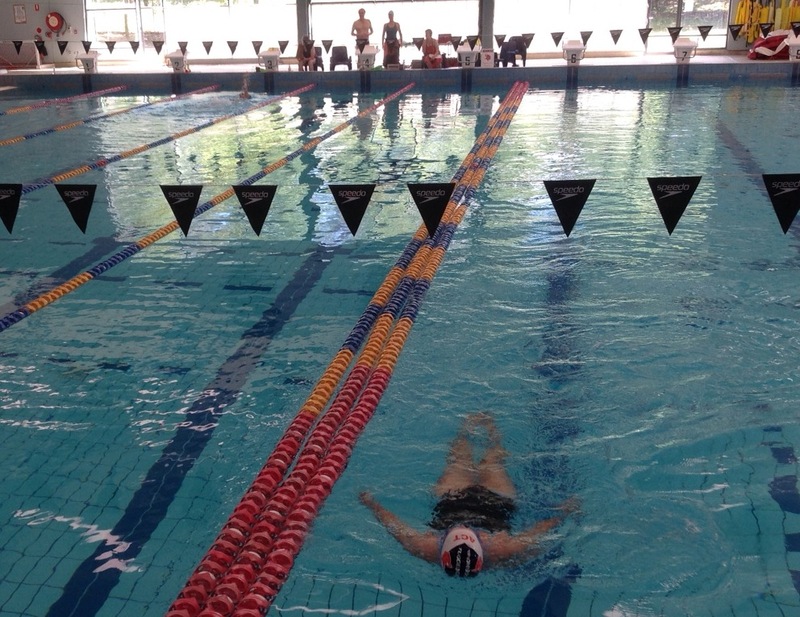 Masters Swimming is an Australia wide, nonprofit organisation for adult swimmers, with the aim to promote swimming and fitness for those 18 years and above, regardless of ability. 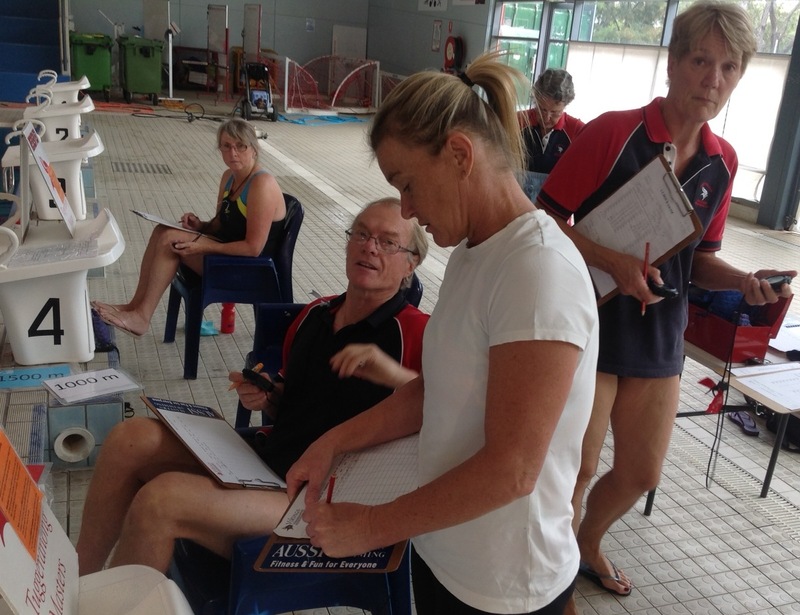 Masters Swimming Australia is affiliated with Masters Swimming International. 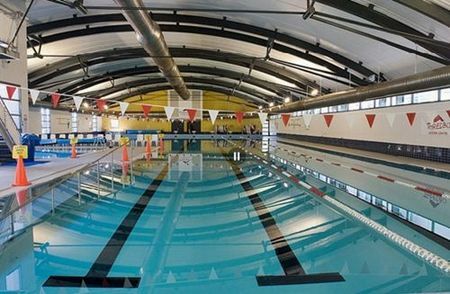 Tuggeranong Masters Swimming ACT has structured a program of training sessions and schedules to assist you in improving your personal swimming ability and physical fitness. Tuggeranong is located in South Canberra, Australia.